In a previous post, it was shown that a private investigator have traced multiple Social Security (SS) numbers to the man who calls himself Barack Hussein Obama. Now, two more PIs are asking why the SS number Obama uses is set aside for applicants in Connecticut — a state in which Obama had never lived and to which he has no associations. The first three (3) digits of a person’s social security number are determined by the ZIP code of the mailing address shown on the application for a social security number. (See Q. 18 of “Frequently Asked Questions” on the Social Security Administration’s website, HERE.) Connecticut’s SS numbers begin with 040, 041, 042, 043, 044, 045, 046, 047, 048, or 049. Obama’s SS number begins with 042. Furthermore, since Obama’s first job was in a Baskin-Robbins ice cream shop in Oahu, Hawaii, when he was 14 or 15, he would have obtained a SS number then as a Hawaii resident. Hawaii’s SS numbers begin with the prefix 575 or 576. This means that he has used at least TWO different SS numbers, which is against the law, because the law says a person can have only one SS number in a lifetime. H/t beloved Fellowship members Steve and FS! NEW YORK – Two private investigators working independently are asking why President Obama is using a Social Security number set aside for applicants in Connecticut while there is no record he ever had a mailing address in the state. In addition, the records indicate the number was issued between 1977 and 1979, yet Obama’s earliest employment reportedly was in 1975 at a Baskin-Robbins ice-cream shop in Oahu, Hawaii. WND has copies of affidavits filed separately in a presidential eligibility lawsuit in the U.S. District Court of the District of Columbia by Ohio licensed private investigator Susan Daniels and Colorado private investigator John N. Sampson. The investigators believe Obama needs to explain why he is using a Social Security number reserved for Connecticut applicants that was issued at a date later than he is known to have held employment. Robert Siciliano, president and CEO of IDTheftSecurity.com and a nationally recognized expert on identity theft, agrees the Social Security number should be questioned. “I know Social Security numbers have been issued to people in states where they don’t live, but there’s usually a good reason the person applied for a Social Security number in a different state,” Siciliano told WND. WND asked Siciliano whether he thought the question was one the White House should answer. “Yes,” he replied. “In the case of President Obama, I really don’t know what the good reason would be that he has a Social Security number issued in Connecticut when we know he was a resident of Hawaii.” Siciliano is a frequent expert guest on identify theft on cable television networks, including CNN, CNBC and the Fox News Channel. Daniels and Sampson each used a different database showing Obama is using a Social Security number beginning with 042. WND has further confirmed that the Social Security number in question links to Obama in the online records maintained by the Selective Service System. Inserting the Social Security number, his birth date and his last name produces a valid Selective Service number. There is no indication in the limited background documentation released by the Obama 2008 presidential campaign or by the White House to establish that Obama ever lived in Connecticut. Nor is there any suggestion in Obama’s autobiography, “Dreams from My Father,” that he ever had a Connecticut address. Also, nothing can be found in the public record that indicates Obama visited Connecticut during his high-school years. The published record available about Obama indicates his first job as a teenager in Hawaii was at a Baskin-Robbins in the Makiki neighborhood on Oahu. USA Today reported the ice-cream shop still was in operation one year after Obama’s inauguration. Politifact.com, a website typically supportive of Obama, claims he worked at the Baskin-Robbins in 1975 or 1976, prior to the issuance of the number in question. Another anomaly in the law enforcement databases searched by Daniels and Sampson is that the date 1890 shows up in the field indicating the birth of the number holder, along with Obama’s birth date of 08/04/1961. A third date listed is 04/08/1961, which appears to be a transposition of Obama’s birth date in an international format, with the day before the month. Daniels disclosed to WND the name of the database she searched and produced a computer screen copy of the page that listed 1890 as a date associated with the 042 Social Security number. Daniels said she can’t be sure if the 1890 figure has any significance. But she said it appears the number Obama is using was previously issued by the Social Security Administration. After an extensive check of the proprietary databases she uses as a licensed private investigator, Daniels determined that the first occurrence of Obama’s association with the number was in 1986 in Chicago. Daniels assumes, but cannot prove, that Obama took on a previously issued Social Security number that had gone dormant due to the death of the original holder. I read this on WND last night, and have given it some thought. I am not defending Barry, but it is possible that with the Baskin-Robbins job in Hawaii that Barry was paid “under the table”. Our #2 son was paid this way for his job all throughout high school. That said, it doesn’t answer the question about the Connecticut connection. Who is this man, and where did he come from???? I believe that he still needs to be scooping ice cream to tourists in Hawaii!!!! This article has been bothering me all morning. I am afraid there is a very unscrupulous reason for this. Just read on WND that google has erased being able to check into it. Thanks for clearing all that up. I did not do the research on the statement when I heard or read it–I did not think SS numbers important at that time. Now I may have to reevaluate my position on the subject. Osama Obama has been keeping something from us—interesting..
See, I was too lazy to go that far. You realize that you forced me to the dictionary with the word ‘salutory’ and it is not there, so I’m stuck on the meaning. If this wasn’t so strange people would accuse you of writing a fictional account. Basically Obama’s background is a never-ending gaping hole of puzzles, mysteries, half-truths, speculations & increasingly non-provable claims as official records keep disappearing & people with first hand knowledge keep dying. He doesn’t have any even half-way tangible historic documentation regarding his “American” upbringing until 1986 when he is 25 years old ????!!! Why is Obama using a CT-issue Social Security number? 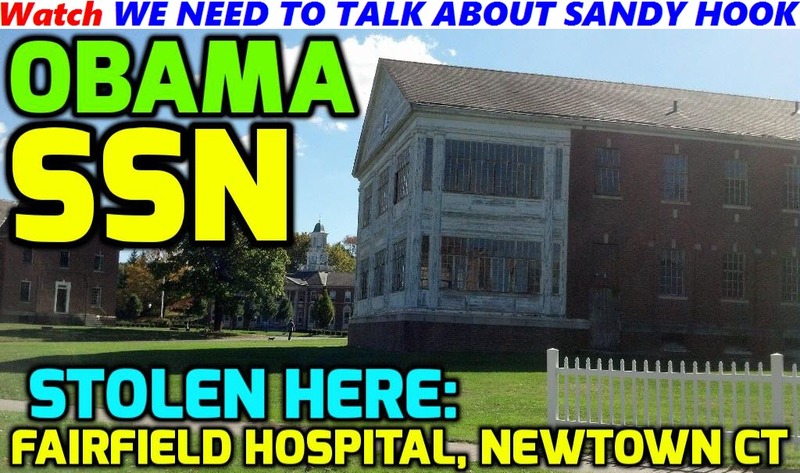 Obama never lived in CT.
Was Obama’s SSN stolen from Harrison Bounel who died in NEWTOWN CT? I still can not understand why people try to make a cheap joke just because they are allowed to comment. I was searching for information for locating SSI #’s came across this and found it kind of interesting. If you don’t have something constructive to say, just keep your silly comments to yourself. If you spent your time more wisely maybe you would have more money.